Hidden risks are stuffed into factor-tilted products — whether allocators see them or not. The explosive success of smart beta products has one of the sector’s head cheerleaders urging investors to undertake a little more conversation, and a little less action. Smart beta is based on decades of academic research into the sources of stock and bond returns, and purveyors aim to soup up index returns by ranking companies not only by size and value, but also by other properties — or factors — like quality, profitability, volatility, and dividend payouts. 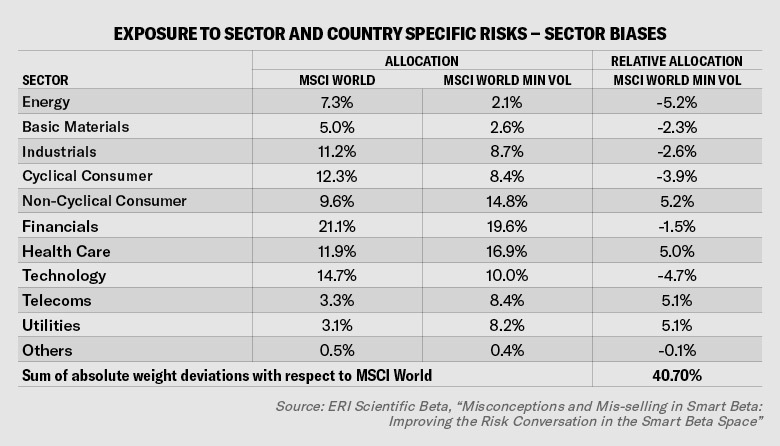 Amid factor mania, veteran quant Eric Shirbini warned in an ERI Scientific Beta white paper released this week that second-order risks and exposures aren’t being sufficiently accounted for by investors or disclosed by providers. In particular, he pointed to three main categories of implicit risk to be monitored and managed: market beta, macroeconomic, and sector/geographical. Paying such minute attention to identifying and stripping out smart beta from the regular beta has obscured the power of bull and bear equity markets on factor-based portfolios, Shirbini argued. Left unmanaged, the strategy could be losing out on the long-term equity market risk premium — a return engine of most any long-only stock portfolio. In the short term, market conditions can extrapolate differences between multi-factor portfolios. A strategy built to outperform the market over a cycle will underperform at certain points, he wrote, and investors can and should know when to expect that. Not that firms shilling products will tell them. “Managing unrewarded risks is one of the key challenges faced by smart beta investors,” Shirbini wrote in his paper. “Index providers are not always transparent about the implicit unrewarded bets to which their offerings are exposed.” It’s worth noting that ERI Scientific Beta — a commercial affiliate of the academic EDHEC-Risk Institute — sells smart beta analytics, advisory services, and indexes tracked by about $25 billion in assets, according to the firm. ERI competes with other providers. Investors selecting a vehicle for exposure to the volatility factor, for example, should pay less attention to recent track records and price than most do, Shirbini thinks, and more mind to tilts not named in the product title. The MSCI World Minimum Volatility index has about two-thirds the annualized standard deviation of its cap-weighted benchmark, the MSCI World, over the last 10 years, data from the provider show. But it also more than doubles investors’ bets on telecommunications and utilities, while slashing exposure to energy stocks, the paper shows.